In lieu of “What Are You Reading” on Mondays this month, I will be posting my participation in Nonfiction November hosted by a different blogger each week. Nonfiction has gone by the wayside in my reading routine and I’m hoping to jumpstart it again this month. Since I’ve only read 10 books this year in the genre *gasp*, I’d have to say When Women Were Birds by Terry Tempest Williams even though it was written in 2012. It’s a toss up between Tiny Beautiful Things by Cheryl Strayed and Can’t We Talk About Something More Pleasant by Roz Chast. Completely different books but both have stayed with me every day. I’ve read mostly memoirs, self-help, psychology and sociology books. I tend to stay away from politics and want to get back into reading more science books, mostly to do with nature and animals. 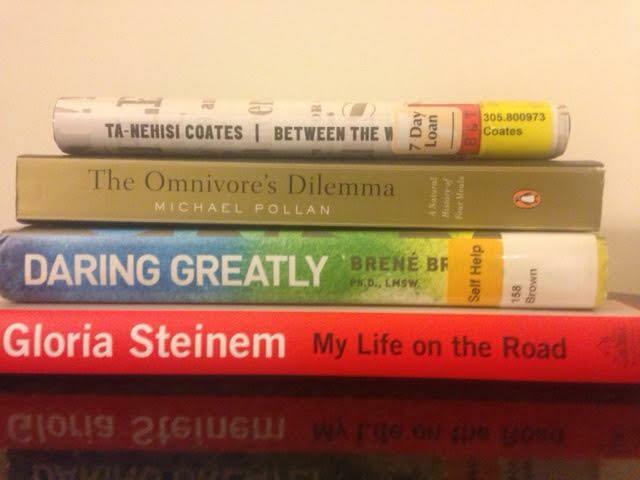 A jumpstart back into the world of nonfiction and recommendations of great books I’ve missed. This is my small pile I hope to read this month. I’ve also put others on hold at the library, so we’ll see what comes in before the month is up. What are some of your favorite nonfiction reads so far this year? Tags: Essays, memoirs, nonfiction, Nonfiction November, social sciences. Bookmark the permalink. Everything on your tbr is on my wish list,I’m particularly excited about The Omnivores’ Dilemma as i love foodie books! Happy reading! I also picked Tiny Beautiful Things as one of my favourites this past year. Yay TBT! I’ve heard such great things about Pollan’s books. Looking forward to reading it finally. I loved her TED talk and have been wanting to read some of her books. A good kick is always welcomed by me! I love Michael Pollan’s food writing…his In Defense of Food changed the way I eat, but I haven’t read Omnivore yet. And I’m considering reading TBT this month also even though it wasn’t in my original plan. I think you’ll enjoy TBT. And Pollan is so great to listen to. Not a food extremist, which I prefer. Looking forward to his book. I loved Omnivore’s Dilemma. I have the Steinem book on reserve at the library but not sure if I’ll get it this month or not. The Steinem dedication page is incredible. It gave me chills and want to read more about her traveling experiences. I really enjoyed So You’ve Been Publicly Shamed. It gave me lots to think about! I’m kind of a non-fiction newbie, so I’m looking forward to following your posts this month! Me too (newbie). Well returning to NF-I read mostly memoirs. I’ll have to check that book out, too! Good pile — I’ve heard lots of good things about the Steinem memoir! I had Can’t We Talk About Something More Pleasant out from the library this summer but didn’t get to read it in time… bummer. I’ll have to look for it again. Oh, you must look for it again. I still get emotional about it-happy and sad tears. Read the Steinem dedication page-it game me chills! The amount of political books coming in at the library is obscene. Every candidate has several books and I have zero interest! Loved Omnivore’s Dilemma — actually, everything by Michael Pollan. I can’t wait to read it. I’ve seen him talk about food issues before and he is compelling to listen to. So down to earth and “normal” Not a food extremist, which I like. 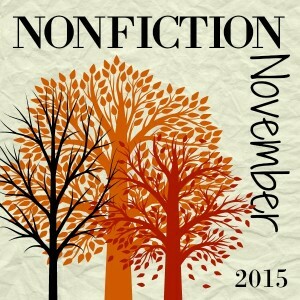 Tiny Beautiful Things is definitely a Nonfiction November favorite!